Drunk Elephant TLC Sukari Babyfacial is the next big thing in skincare. The line is make with minimal, and non-toxic ingredients that give results on par with a professional doctor's treatment. After using Drunk Elephant TLC Sukari Babyfacial I can now say it did give me skin as smooth and even toned as if I'd had a professional peel from a dermatologist - with no irritation. The most amazing feature of Drunk Elephant TLC Sukari Babyfacial is that it's a effective skin treatment with AHA (alpha hydroxy acids - like glycolic and lactic acids ) and BHA (beta hydroxy acids - salicylic acid)) but extremely gentle. The mask also features soothing matcha tea, apple extract and niacinamide to help brighten skin. 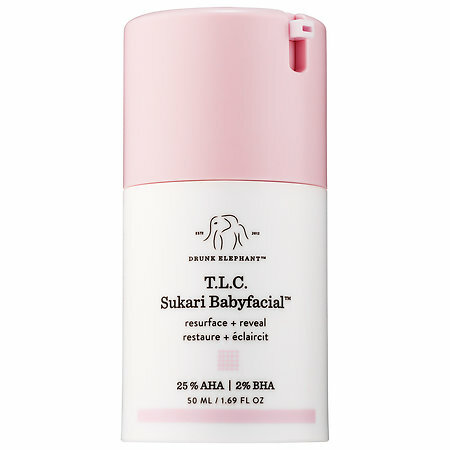 Drunk Elephant TLC Sukari Babyfacial has a creamy formula, and I applied once a week, for 20 minutes, as directed. After rinsing off, my skin was very soft, smooth with no irrigation. I felt just the slightest bit of tingling while the mask was on my skin. For the next few days, I continued to see the results - smooth, glowing skin that felt soft to the touch. This mask will work with all skin types, but if you have sensitive skin, I recommend building up your tolerance by starting off week 1 with 10 minutes, then 15 and then in the third week, 20 minutes if your skin looks like it can handle Drunk Elephant TLC Sukari Babyfacial successfully. Drunk Elephant TLC Sukari Babyfacial is quite frankly one of the best at home peel products I've tried over the years, and I plan on keeping this in my skincare rotation permanently.